“From beginning to end”. Aperitifs, appetisers and desserts. 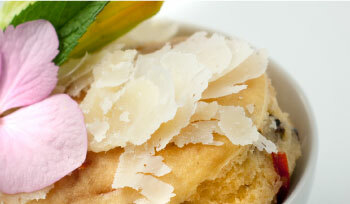 Served as an aperitif or as a dessert, Grana Padano is the perfect way to whet your guests’ appetite or to end a meal. Ideally, you should take it out of the fridge one hour before being used, unwrapping the cheese beforehand to allow it to breathe and fully express its fragrance and flavour.<br>Cut the cheese into small pieces shortly before serving to stop them drying out. In order to fully enjoy the flavour of the older vintages, it is best to eat them with bread. 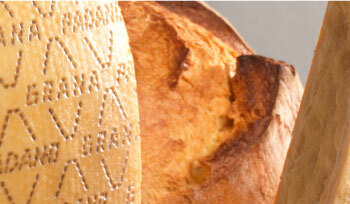 The ideal accompaniment is the pagnotta, the traditional, salt less sour dough loaf - preferably baked in a wood-fired oven. However, homemade whole-wheat and black bread, with a thick crust, are both equally delicious accompaniments. Breads with herbs or other ingredients, on the other hand, can alter the flavour, overpowering Grana Padano’s subtler flavours. Are you craving something special? Something sweet and salty at the same time? Something unusual, tasty, maybe even exotic? 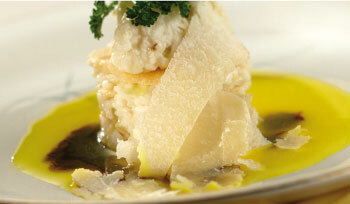 Here are three suggestions to enhance Grana Padano’s flavour with jams, fruit chutneys and spices. Dinner isn’t complete without a glass of wine. Try an intense, aromatic red wine enhanced by some pepper. Do you like the sweet, comforting flavour of vanilla? Perhaps combined with a fruit that is just as sweet, like pears?